Of course with a braid or updo you want to see the hair go in different directions, but you don’t necessarily want to see shiny scalp. It distracts from the over all look, right? If you finish a hair style and look in the mirror and you see a strong part/scalp where you just don’t want to but you don’t want to start over, then don’t! 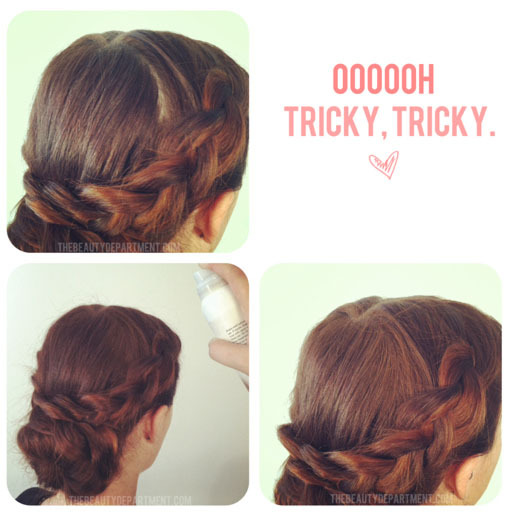 Spray the part lightly with a colored dry shampoo. I always have THESE ONES in my kit in every color. I don’t use them as a daily dry shampoo because I have another favorite for that, but I do love this to cover an unsightly part. You can also find them in travel size sometimes. Lightly (don’t over do it because it will look chalky) spray the visible scalp line with a shot of the colored dry shampoo and the focus will be right back on the braid or updo where it belongs.